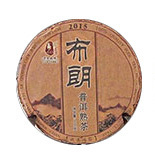 These 100g pucks made from tea trees around 100 years old are delicious now but have the complexity and potential to be even better if stored. Mix and match with the Bulang Raw to taste a raw and ripe Pu'er from the same region. They make great gifts! Brewing tips: Rinse 5-8 grams tea for a few seconds with water (100°C / 212°F), and discard the rinse, then add more water (6 ounces) to brew, and after 5 to 10 seconds pour the tea into a separate cup to drink. By pouring off the tea you can reuse the leaves for subsequent rounds, by adding more water and gradually increasing the steeping time.